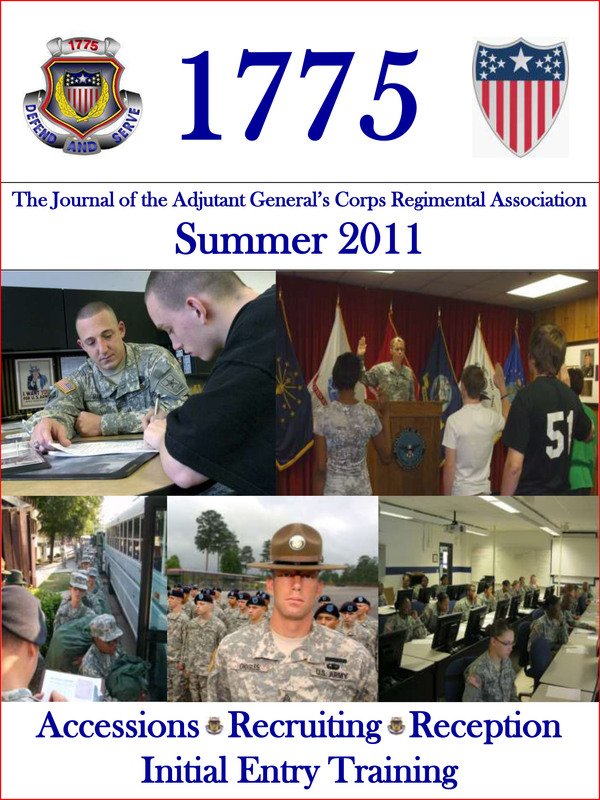 This edition of 1775 is dedicated to ―Personnel Accessions, Recruiting, Reception and Initial Entry Training‖. After almost ten years of persistent conflict, the Army continues to plan personnel accessions, recruit quality Soldiers in the numbers needed, receive these new Soldiers in a professional and expeditious manner, and provide initial entry training skills required of our Army. AG Soldiers and HR civilians have been instrumental in this mission and to the Army’s success during a most tumultuous and high OPTEMPO period in our history. Whether the motto is, ―From First Handshake to First Unit Assigned‖, ―Provide the Strength of the Army‖, ―Freedom’s Front Door‖, or ―Victory Starts Here‖, this edition of 1775 looks at what it takes to support America’s sons and daughters becoming Soldiers within our ranks.